Martin Zayranov started studying the violin when he was six years old at the National School of Arts in Varna (Bulgaria). At ten years old he made his debut as soloist with the Varna State Philharmony. Two years later he was already a junior student in the violin master class of Prof. Mario Hossen at the New Bulgarian University in Sofia. Martin has been in a laureate in many national and international competitions, including among others the Emil Kamilarov (Bulgaria), Jeunesse musicale (Romania), Sveoslav Obretenov, (Bulgaria), EUROASIA-2013 (Japan), Professor Nedyalka Simeonova (Bulgaria), Andrea Postachini (Italy), International Fritz Kreisler Competition (Austria). 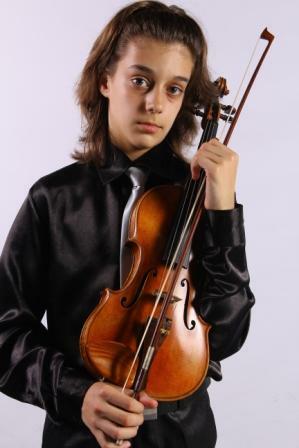 He is a 2nd prize laureate of the 11th International Competition ‘Young Virtuosos’ in 2015. He has also been awarded the ‘Varna 2103’ and ‘Open Society 2014’ prize. In 2013 he was a soloist at the Fortissimo fest ‘Music Under the Stars’ in Burgas (Varna), Sofia and Plovdiv with Sofia and Varna Philharmony Festival Symphony Orchestra conducted by Maxim Eshkenazi He has also performed as a soloist with many orchestras, including among others the Academic Orchestra “Orpheus” at New Bulgarian University, Sofia Philharmonic Orchestra, Sofia Festival Orchestra, Les Orpheistes Festival Orchestra as well as Philharmonic orchestras in Varna, Plovdiv, Russe, Shumen, Pleven, Vratsa and Razgrad. Martin has participated in recordings, concerts and interviews with the Bulgarian National Radio, Television BTV, Radio, Varna and Television ‘Black Sea’ among other. Martin plays a copy of Guarneri del Gesu violin (2007) by Japanese violin maker Ritz Iwata, which he was awarded at the 1st International Competition ‘Vitam Inspirare’ in 2013. If you are interested in working with Martin, please get in touch with the EMCY Office.